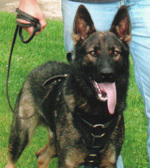 DDR "Lord von den Grauen von Monstab"
Yumi is a lovely black sable female of substantial build with a solid and sure nature. 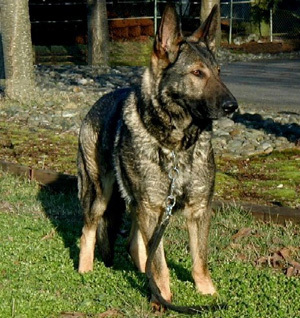 She possesses high ball drive and fast, energetic obedience skills along with very good grips and biting strength. She has high courage and confidence, performs on all types of footing surfaces without issue, and yet also has a warm, loving nature with children. V Fero vom Zeuterner Himmelreich. Yumi is linebred 5-5 on Umsa Bungalow. She is a large bodied female with substantial bone and solid working structure. She is a sure and confident female, with good social skills, and is excellent with children. Yumi has produced high quality pups for our facility. She is an excellent mother and has proven to produce pups which are highly focused and intelligent, confident and sure of themselves. Pups are quick to have ball drive come on. 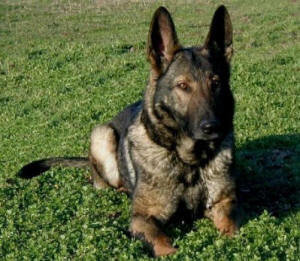 > Her pups have deep pigmentation of coats, in colors of solid blacks, dark sables and black sables. Pacheco haus and van Guy's Hof. "T" Litter Born October 1st, 2009. This litter produced pups that were robust and active immediately upon their arrival. Pups are intense, persistent and demanding at only 8 hours of age. 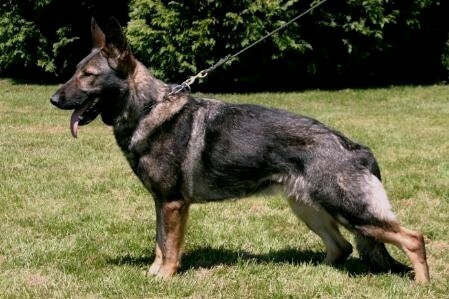 These will be incredible working prospects for those interested in a serious competition dog. Solid Blacks and beautiful dark red sables. View Previous Pups; litter with Lux x Yumi Litter born Oct. 4th, 2008 This litter was a 3 time repeat breeding to our DDR East German stud dog Lux vom Kameruner Eck. 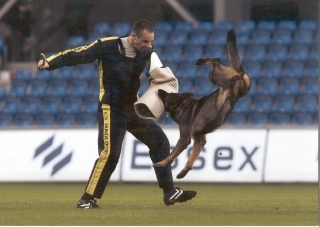 Their 2006 litter and 2008 litter both proved to be an excellent combination which produced highly intelligent clear headed working pups, showing early development of ball drive and scenting ability. Litter had excellent bone density with beautiful structure and head type. Pups were sure of nerve and highly social.